Last month, Disney unveiled it’s latest project to the public at Disney California Adventure Park. World of color is a nighttime show in the lagoon of Paradise Pier, using the elements of water, color, and fire, with a few surprises. It incorporates scenes from many beloved Disney films, and brings the characters to life. 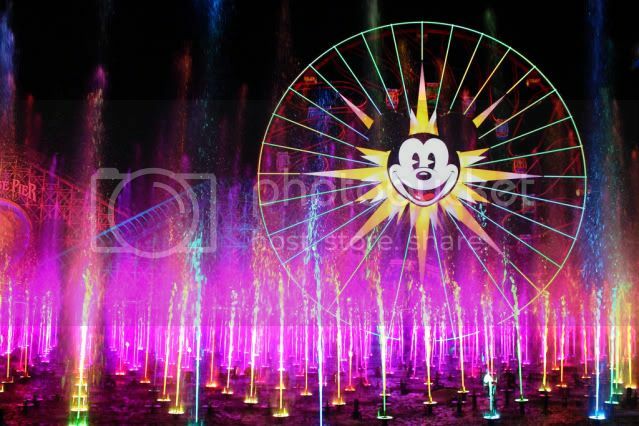 First, you need to decide how you want to see World of Color (WoC). There are two shows, 9:00 and 10:00 with a third show at 11:15 added if it is a busy day at he park. 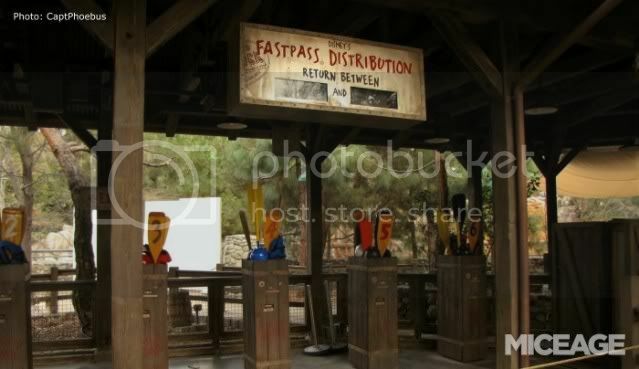 In order to attend the show, you need to obtain a fastpass from the Grizzly River Run (GRR) fastpass station. If you want the best seats for the 9:00 show, you’ll have to arrive at least an hour before park opening to line up outside the park, which is what I did (though I arrived two hours early just in case.) Once in, you go to GRR and line up, a few people run there, but you’ll be fine just walking. Once you acquire a fastpass, it will tell you what section you’re in, and what time to return. The earlier you get a fastpass, the better section you get. I got blue, which is the best section (aside from preferred viewing, which I’ll talk about in a moment.) Other sections include, red, blue bridge, yellow, and green. If you don’t want to go to the 9:00 show, you’ll need to be ready to grab fastpasses as soon as they start giving them out for the 10:00 and 11:15 showing. The other option is to get a preferred dining experience, which includes a full course dinner at either Ariel’s Grotto or Wine Country Trattoria, and tickets to WoC in the preffered viewing area, the best section. It’s $40.00 per person, so I opted to grab my fastpass as early as I could. After enjoying my day at Disneyland and California Adventure, I went over to the viewing area two and a half hours early (30 minutes earlier than the suggested arrival time), which hold’s about 4,000 people. I was surprised to find a ton of people already lined up behind a barricade waiting to get to their spots. However, it was not a problem. They let us in, two hours before showtime. I got my spot, and we waited. One thing that really impressed me was how easy it was to move in and out of the viewing area. From past experiences, Disney has not been good at this. If you’re at Disneyland waiting to watch the fireworks or Fantasmic! Once you’re in your spot, it’s very difficult to leave to get food or go to the restroom and return. With WoC, they had a path set aside for you to move in and out, and it was very easy. About thirty minutes before the show, they have some pre-show entertainment with sining and a little game where you get assigned a color which coordinates with a Disney character. We got blue, and the Genie from Aladdin. Basically you had a cheer and the loudest section won the game. It was definitely cheesy, but it was also definitely more entertaining than just sitting around. Then, it was time for the show. The show is absolutely terrific. It’s quality, entertaining stuff. I had high expectations going into that night, and Disney, like it always does, did not disappoint. They use everything from water, to mist screens, to fire, to lasers, to even things that I’ve never heard of, like colored pixie dust that floats above the water spouts. It’s really something incredible to see. 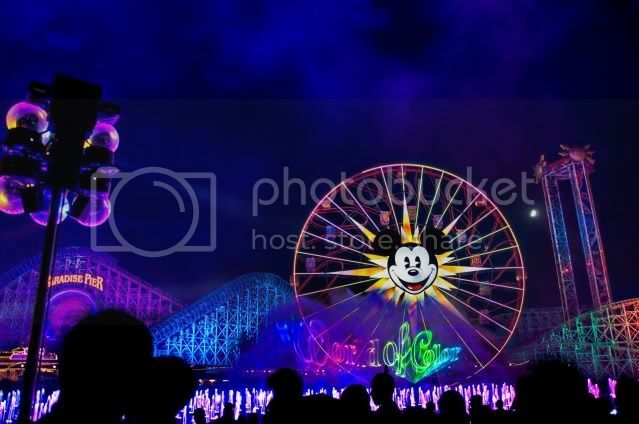 I also found it very interesting how they use the ferris wheel lights with the show. It’s always neat to see them incorporate other things from the park into the show. World of Color lasts about 30 minutes, which is pretty long for a Disney show, and it was definitely worth all the hours of waiting earlier in the day. The thing that makes WoC so great is that it tugs on every emotion. It can make you laugh, it can make you cry, you name it, it did it. The effects were out of this world and it was really an amazing show. From scene to scene, it does transitions very well. For me, the best scene was the Buzz Lightyear and Zurg scene, as the laser effects were very neat. The Wall-E scene was also definitely up there. It’s definitely visually stunning and a very welcome addition to the under refurbishment California Adventure Park. It should bring a lot of people in, and if you can get the chance to check it out, I highly reccomend it. If you aren’t able to make it to the park, check it out on YouTube.